Last weekend at the Magny Cours circuit in France the books were closed on the 2005 World Superbike season. I’ll do a full season review soon but here is my race review. First of all, while this was the end of the season it was the start of better things for at least two riders: Chris Vermeulen and Lorenzo Lanzi. Race 1: the Chris Vermeulen story. With rain at Imola ending any chance that the Australian had of bringing the World Superbike title to Honda this year the only thing left for the youngster to do was to win races. With the news out that Chris would be racing the last three MotoGP rounds in place of the injured Troy Bayliss it wasn’t really like he needed to impress anyone but that was clearly his goal at Magny Cours. Vermeulen absolutely destroyed all comers in Superpole to turn in a time nearly half a second faster than anyone else. When race time rolled around he did a repeat of that crushing performance. When the light went green in race one he simply checked out on everyone else. Suzuki mounted Kagayama ran fast enough trying to catch the Ten Kate Honda that he pulled away from the battle for third but was never a threat to Vermeulen out front. Therefore the focus of the race shifted back to a stellar fight between Toseland and Muggeridge. For the Ducati mounted Englishman it was an effort to convince the Italian company that he should be on their payroll in ‘06. For the Honda mounted Aussie, it was simply a chance to show everyone he is as talented as his spotlight grabbing teammate. Both proved their points but it was Toseland that made the last of the close passes shared by the two riders but even then the final outcome wasn’t clear until the last corner. Corser brought his Suzuki home in fifth, not exactly what he was looking for after claiming at Imola that he would win again at the final round to prove his championship wasn’t a fluke. Race 2: the Lorenzo Lanzi story: In qualifying before the race, it was the up and coming Ducati star Lanzi who had been the fastest man on the circuit. He couldn’t quite match that performance in superpole but still found himself second on the grid. In race one, Lanzi had tire problems which held him back for an eventual ninth place finish. Race number two is actually two stories. The first, which only lasted to the first corner, is less about any particular rider and more about how dangerous motorcycle racing can be. When the lights went green the entire field stormed into turn one at around 90 miles per hour in third gear. Muggeridge had some sort of problem which sent him careening into the back of Pitt. This started a chain reaction that also took down Bussei, Martin and the French wildcard Da Costa. Muggeridge and Bussei were both transported with injuries. Pitt and Da Costa limped back to their pits and their backup bikes for the restart. Martin didn’t have a spare Foggy bike and was thus done for the day. The story of the second start was all Lanzi. In order to make up for his heartbreaking result in the first race, after building such high hopes in qualifying, Lanzi came out for the race two restart on a mission. Vermeulen got the holeshot at the light and actually pulled nearly a second gap over the rest of the field. Lanzi, however, was not to be denied. He used his factory Ducati motor loaned to his Caracchi team to its full potential and turned in a new lap record to close the gap back down. Lanzi’s speed also allowed him to pull away from the trailing scrap between Kagayama and Haga. They, in turn, pulled a gap over an equally fierce fight between Brits Toseland and Walker. After Lanzi closed the gap up front he seemed content to follow Vermeulen and look for a chance to strike near the end of the race. That opportunity was gifted to the Italian sooner than expected when the lead Honda’s chain jumped the sprocket on lap 18 and ended Vermeulen’s day. Lanzi, who now had a huge lead, maintained his pace and took his second win of the season. As the race wore on, Yagayama was able to break Haga to end the most spectacular tussle on the track and thus to secure a second place result. Haga held on for the final podium spot in third. ‘05 Superbike title holder Corser found some late race speed to pass the two Englishmen and nab a fourth place finish. The intra-country competition between Toseland and Walker was eventually won by the injured Kawasaki rider despite a spirited defense by the Ducati mounted ex-champ. Walker deserves that fifth place more than anyone given the amazing ride he put in despite still recovering from a broken elbow. So it is the end of the year for Superbikes. As I said at the start of this article this weekend also marked two beginnings. For Vermeulen, this starts his internship in MotoGP as he will spend the couple of months racing the Camel Honda as a replacement for Bayliss. He’ll be racing at home in Australia this coming weekend, then at a track in Turkey that is new for all the riders and finally the season closer at Valencia. 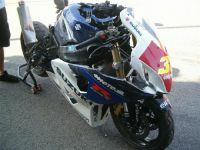 If Vermeulen can put in respectible performances aboard the RC211V then he will be assured of a MotoGP ride in ‘06. Its hard to get a better new beginning than that. For Lanzi, his win at Magny Cours has assuredly locked up his ‘06 ride on the factory Ducati. Having an Italian rider aboard the Italian bike is always a dream of both the company and it’s fans. Lanzi has put in some spectacular rides this season aboard a privateer Ducati and seemed to naturally fall into this position once Laconi was injured. His results speak for themselves in that regard. Whether the 999 can be competitive near year against the in-line fours is yet to be seen but they have a rider who is certain to add excitement to the series in 2006. Congrats to both of these young riders for having such a strong finish for the season and best of luck to them as they take the next step in their respective careers. This weekend the World Superbike paddock bids “Adieu” to another season. The closer is again the magnificent Magny Cours Circuit in France. The track is built to European Formula 1 car specs but is still a fantastic motorcycle racing venue. So much so, in fact, that the annual Bol D’Or 24 hour endurance motorcycle race was moved to the track from its original home at Paul Ricard. Unlike America, where endurance racing is barely a blip on the screen of even die hard motorcycle racing enthusiasts, the Bol D’Or is hugely popular in France and thus it says a lot that Magny Cours hosts the event. The 2.74 mile long track has a bit of everything. Like most F1 tracks, there are chicanes and hairpin turns which slow the bikes down to first gear. There are a few of these which stand out. First is the Adelaide Hairpin about halfway through a lap where the bikes have to turn back practically 180 degrees. The second is the Imola Chicane where the bikes have to transition from right to left while very near top speed. This then leads into the third slow section which is the Chateau d’Eau Hairpin. Put all of these together than the bikes will have to run relatively stiff front end to deal with all the braking forces. Technically, the track is listed as having 14 turns but there are large number of little kinks around the tracks so that count is a bit deceiving. These same slight bends are what give the track a completely different character than the tight turns might initially indicate. The first quarter of the track from the time the bikes leave Estoril all the way through Golf corner and into the Adelaide hairpin is a long sweeping right hand turn. The front forks which have been set up to deal with major braking will now be too stiff for the fast sweeping corners. For the riders, it means finding a compromise on suspension and, in turn, deciding which part of the track they will be fast on and which they will sacrifice. It should be very interesting to watch the splits to see which riders made which choice. In addition to the excellent track facilities there will also be the bike crazed French fans on hand. As with any home race, expect the native riders to put in noticable performances. In France, that means Regis Laconi and Sebastian Gimbert. Laconi is still recovering from his tendon injury and was visibly slowed by it last weekend at Imola. Only time will tell whether the energy from the French fans will help him over come his pain. Gimbert actually has two things going for him. First, is the fact that he is racing on home soil. Second is the fact that the former endurance champ probably has more laps around Magny Cours that any living motorcycle racer. Last year, Gimbert really showed his stuff at Magny Cours so keep an eye on him to do the same. Finally, another endurance racing star will be on hand, in this case it is David Checa who is making another wildcard appearance for Yamaha. Like Gimbert, Checa knows the circuit better than most since the Spanish rider has been racing in the World Endurance series for the past few years, so expect him to be further up the order that wildcards generally appear. Still, the favorites this weekend have to again be Troy Corser and Chris Vermeulen. The two riders have been the class of the field over the past three or four weekends and I suspect they will continue that at Magny Cours. Both riders have something to prove: Corser wants to show that he was just playing conservative over the last few races and not that he was out classed by his Honda rival. Vermeulen, on the other hand, wants to show that he is the best rider on the track and that it was only bike problems early in the season that allowed his Suzuki counterpart to build up the insurmountable points lead. There are a lot of riders that are still out trying to get rides for next season. James Toseland probably tops the list, although it isn’t clear whether this teammate Laconi is signed for ‘06 either. Likewise, Kagayama will be out to show that he deserves to be back in WSBK next year as his season as been inconclusive with early season success followed by a mid season slump. Most of the Yamaha riders are still looking for a job and riders like Pitt and Abe could go either way at this point. Both need to show they can do better than struggle for top ten finishes. Also on the list of riders that will be hoping to end the season strong is the long list of guys joining Laconi on the injured reserve list. Ben Bostrom is still recovering from a back injury and if anybody needs a decent result to close out the season its Benny. The Kawasaki squad of Chris Walker and Mauro Sanchini are still recovering from elbow injuries so they will again have Fonsi Nieto on board as a wildcard in France. Gary McCoy is still out but Foggy has brought in test rider Andi Notman to ride the second Petronas bike. Looks like the racing this weekend will make for a great way to close out the season. A storm has been brewing in the World Superbike over the three rounds as Ten Kate Honda’s Chris Vermeulen has been winning races and clawing back championship points in the battle against leader Troy Corser. With the World Superbike series winding down to just two weekends remaining the recent races at Imola where a watershed moment. Coming into the race the pressure was on Vermeulen as he trailed Corser by 60 points at the start of the weekend. However, Vermeulen was looking good having won three off the last four races and coming in second behind Lanzi in the race he didn’t win. This streak meant he had been consistently out scoring his rival countryman and slowly closing the points gap. If Vermuelen could add to his string of victories at Imola then he could keep his title hopes alive until the final round at Magny Cours. As early as the first practice it was obvious that both Australian riders came to Italy prepared to do what needed to be done. Both were among the fastest riders in the first practice and both were one-two in the first qualifying session with Corser holding a slim tenth of a second advantage in lap times when the sticky tires were mounted up. The two riders were again quick in the second qualifying round, again separated by little more than a tenth of a second, although Corser’s teammate Kagayama split the two for second on the provisional grid. When superpole rolled around Chris did what he had to do and turned in the fastest lap seen all weekend with a blistering 1:48.075 lap time. Corser ended up a half second back in third, the two kept apart on the grid by Ducati’s Regis Laconi. The second Ducati of James Toseland finished off the front row. Speaking of the two Ducati riders, this is a good time to give a brief review of the state of the Superbike grid. Having both of the Ducs on the front row is amazing and a testament to how hard their riders were pushing to impress the team bosses with them racing so close to Bologna. Laconi was back for his first time on the bike after his Assen accident that damaged a tendon in his arm. Toseland, likewise, was racing injured having bruised his hand in a practice crash on Friday. Lanzi ended qualifying at the front of the second row on his loaner factory Ducati meaning all three factory bikes were in the top five. Given Ducati’s history at Imola this surely had the Italian bosses worked into a frenzy. Things weren’t quite so rosy over at Kawasaki where injured riders Walker and Sanchini were both recovering from broken elbows. Kawasaki brought in newly unemployeed Fonsi Nieto to ride a third bike but given his performance for Yamaha earlier in the season this didn’t necessarily look to improve their the green team’s chances. I’m sure there were long faces in the Kawasaki garages all weekend but this was especially so after qualifying where Walker was mired back in 16th with his two teammates further down the grid behind him. Another rider that was riding injured was Ben Bostrom who was flung off his Honda during qualifying. No major injuries but a general battering that wasn’t going to do him any favors. Missing completely from the grid was Foggy Petronas’ McCoy who was out with a broken coccyx. The Aussie is likely out for the remainder of the season. The injury list aside there were a few other surprises when qualifying was over. The second row, as I’ve already mentioned, was headed by Lanzi followed by Haga, Kagayama and then the bombshell of Bostrom who turned in the eighth fastest time despite his aches and pains. Given how poorly he’s qualified for most of this year, maybe he needs to start highsiding during practice on a more frequent basis as it seems to actually improve his results. Another surprise was Frankie Chili who was down in 14th on the grid. He has been running closer to the front that than all season and I thought he would get caught up in the spirit of racing in front of his home crowd as he usually does at Monza. Just racing in Italy is usually good for a front row start for the Honda rider but apparently that wasn’t the case this weekend. With the dark clouds gathering, both figuratively and literally, the riders lined up for race one. Before things could get started the clouds opened up with a brief shower that drenched the track. The marshalls decided to give all the riders a brief wet weather practice and then get things started under “wet race” rules. With the track damp but drying, most of the riders went with slicks but Vermeulen took a big gamble to go with an intermediate front. This meant he should have more confidence in the early laps but would risk destroying the tire should the track dry up during the race. When the green lights came on it was Corser who made the leap off the line to the front of the pack with Vermeulen a close second. Half way through the first lap Chris put the grooved tire to good use to make the pass on Troy. Even as early as the first lap the wet conditions started to cause problems for riders. Chili and Silva crashed out immediately and Muggeridge retired with mechanical problems after overheating his clutch trying to get the slicks to hook up on the wet start. Within a few laps others would join the crashers with Abe, Kagayama, Lanzi and Pitt all dropping their bikes due to the wet surface. Pitt and Kagayama were both able to restart but both were outside the points by the time they returned to the track. The race quickly broke into three main battles. Up front, the two championship leaders were stuck tight together with Vermeulen holding the tire advantage but Corser clearly with the horse power needed to force a pass despite his more tentative corner entries. A few seconds back was another dog fight, this one between Toseland and Haga. The third group, a few seconds even further behind, was a scrap between Walker, Martin, Neukirchner and Gimbert. In all three groups, passes were frequent but the most spectacular racing was between Haga and Toseland. Neither was willing to let the other lead and both were making risky passes given the mixed track conditions. Despite their antics, the battle for second place started to make up ground on the lead pair which made it look as if the fight for victory would boil down to a four bike scrap. However, two events happened almost simultaneously which changed all that. First, Vermeulen made another pass on Corser to retake the lead but then upped the pace to the same lap times being running by the chasing riders. Second, with six laps to go Toseland ran wide and allowed Haga past for third. With Toseland loosing valuable time and Haga stalled in his forward progress, the battle boiled down to just the two men in front. Once Vermeulen went to the point position Corser seemed content to park on this rear wheel and wait for a last lap pass. This was probably a wise strategy, especially considering that the track had indeed dried up during the course of the race which mean that Vermeulen’s intermediate front tire was busy over-heating with each lap. It also looked as if his rear tire was taking a beating as well since he was drifting the rear each time he tried to get the Honda’s power to the ground. By the last lap, Chris was all over the track but despite his obvious tire problems his lap times weren’t dropping off. To the surprise of everyone, and no one more so that Troy Corser, the Honda rider was able to maintain his lead through the last lap, despite an attempt by Corser for a pass, and to hold on to win the race. This victory allowed him to close another five points on Corser and keep the championship storm rolling into the second race. Haga head on to third and Toseland recovered from his off track mistake to finish fourth. Martin made a last lap pass on the wounded Walker to close out the top five. The rain took its toll with only 16 bikes completing the race despite 34 bikes originally lining up for the start. Unfortunately, Vermeulen’s dream weekend came to a rapid halt when the real storm intervened. While the riders were preparing for the second race another cloud burst soaked the track and this time it wasn’t likely to dry up. After some of the top riders were given a tour of the circuit in the pace car it was decided that the track was too dangerous to continue the event and the second race was cancelled. While it is always disappointing to have a race cancelled I applaud the race marshalls for making that decision. (This is especially true given how poorly the marshalls handled the rain storm that happened during the World Supersport race earlier in the day!). With race two cancelled due to the rain, the math worked out that there weren’t enough points available at the upcoming Magny Cours rounds to allow Vermeulen to catch Corser. The sun broke through the proverbial clouds and shown down upon Corser as the cancellation made Troy Corser the 2005 World Superbike champion with a 55 point lead over Vermeulen. This marks the first ever WSBK championship for Suzuki and the second WSBK title for Corser. As I mentioned at the beginning of the season, Corser had a deep desire this year to show that his poor results over the past four seasons while he rode the Petronas were because of the bike he was on and not a lack of talent on his part. He has definitely proved that this year. I remember watching Troy ride the Fast by Ferraci Ducati in ‘94 enroute to the AMA Superbike championship and knowing he was a spectacular rider. That opinion was reinforced in 1996 when he won the World Superbike title. I think this title shows just how much his talent was wasted in the years between 2002 and 2005. I think Corser could have given both Hodgson and Toseland runs for their money during their respective championships if he’d just had something decent underneath him. Finally, congratulations to Troy Corser and the Corona Suzuki team for winning the ‘05 Superbike title.